Today I am both humbled and excited. 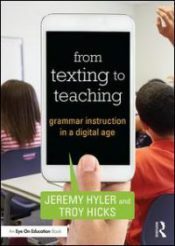 Tomorrow my second co-authored book, from texting to teaching: grammar instruction in a digital age (Yes, I know the title is not capitalized, that was intentional) will be released to the world. 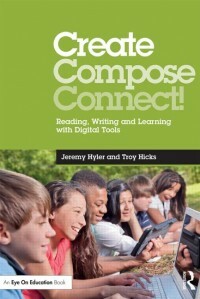 Troy Hicks again, was my co-author and it was an interesting journey to write this book and bring it to educators. Though I could never put myself in the same category with grammar greats like Jeff Anderson and Constance Weaver or even be published by giants like Heinemann or Corwin Press (No disrespect). Quite frankly, I am content where I am at with the work I have done. On the other hand, Troy and I have created a resource where teachers and educators can see some benefit to this book. Not only will educators see the historical struggle of how grammar has been taught, but also that the challenges teachers may face with technology today don’t really have to be challenges. Those challenges can be turned into opportunities for teachers to help their students see the difference between formal and informal writing spaces. Furthermore, students will have a greater appreciation for grammar when we use their spaces and work with them in the worlds they live in day to day. Grammar instruction will always be challenging and I am positive that others will develop new and exciting ways to reach the students they come in contact with every day. It was a pleasure and challenge to not only write this book, but to write it with someone who has become one of my closest friends and colleagues. Troy continues to challenge me both intellectually and personally in ways that make me a better educator and person. So, without further delay, we give you our book and hope you find some helpful information to improve your students understanding of grammar. Please let us know how we can further help you and please visit our companion site with the book.